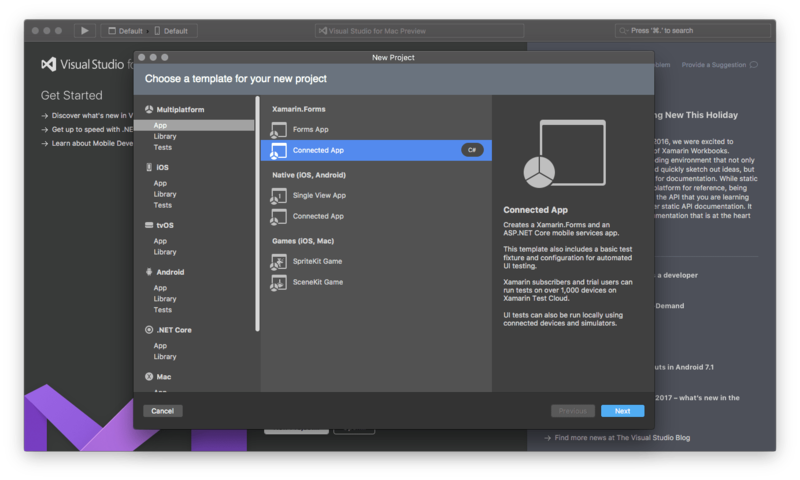 With Visual Studio for Mac, a lot of new project templates are now available to macOS developers. For example, you can now create an ASP.NET Core or a .NET Core console project directly on your Mac. Wow! But, in my opinion, one of the most interesting project template is the Connected App. With this template you’ll be able to create a complete solution with a Mobile app (iOS, Android and Windows or Xamarin.Forms) and a Backend app, an ASP.NET Core mobile project that will be hosted in an Azure Mobile Services app. 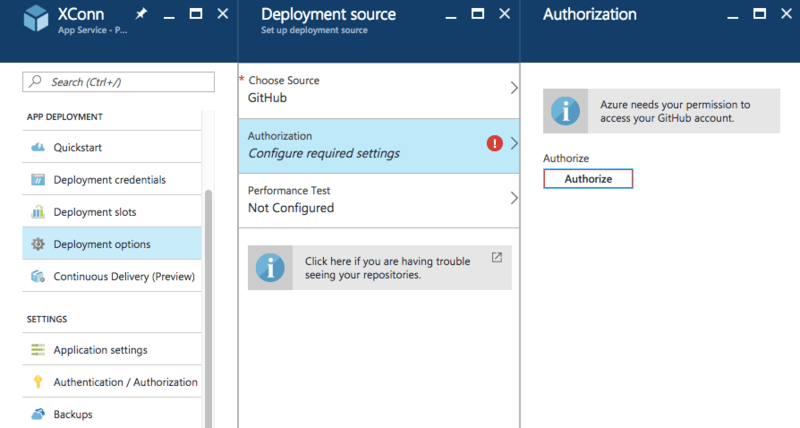 In this post we’ll see how we can create a Connected App and publish our backend to Azure by using GitHub as source control host. Yes, it is a Continuos Delivery system. First of all, you need to create a new GitHub repository. If you already have a GitHub repository, please go ahead. So, navigate to your GitHub page and on Repository tab click on New. After that, create a README.md file to initialize your repository and, on desktop side, clone the repository by using your git client (like GitHub Desktop). By using your git client, commit and push the project on GitHub. 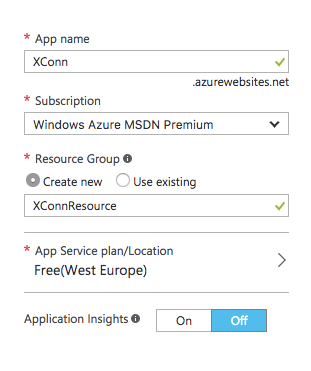 Finally we are now ready to publish the service to Azure. So, go to the Microsoft Azure portal, log-in into your account and create a new Mobile App. To connect our Mobile Service to GitHub, go to Deployment Options and choose GitHub as source. Then you’ll be requested to authorize access to the GitHub account. Finally, select the repository and the branch you’d like to use. And you have done! 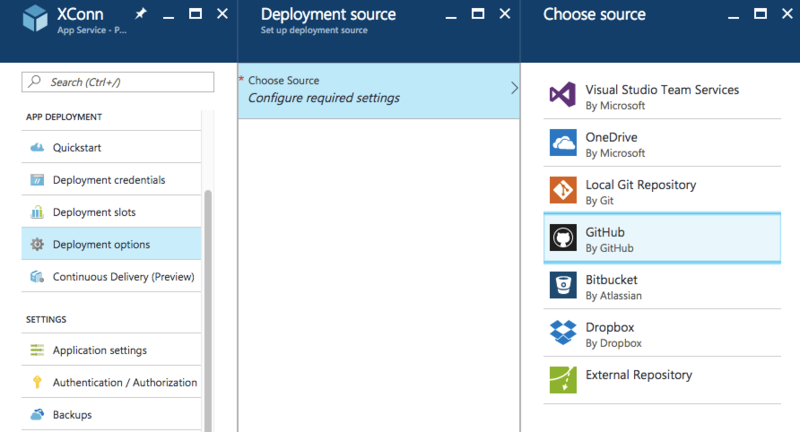 Now Azure automatically start the deployment process and … BOOM! Handling ASP.NET Core Web Application deployment. D:\home\site\repository\XConn\Droid\XConn.Droid.csproj(137,3): error MSB4019: The imported project "D:\Program Files (x86)\dotnet\sdk\1.0.0-preview3-004056\Xamarin\Android\Xamarin.Android.CSharp.targets" was not found. Confirm that the path in the <Import> declaration is correct, and that the file exists on disk. D:\home\site\repository\XConn\iOS\XConn.iOS.csproj(163,3): error MSB4019: The imported project "D:\Program Files (x86)\dotnet\sdk\1.0.0-preview3-004056\Xamarin\iOS\Xamarin.iOS.CSharp.targets" was not found. Confirm that the path in the <Import> declaration is correct, and that the file exists on disk. Failed exitCode=1, command=dotnet restore "XConn\XConn.sln"
An error has occurred during web site deployment. What happen? Just some background info. 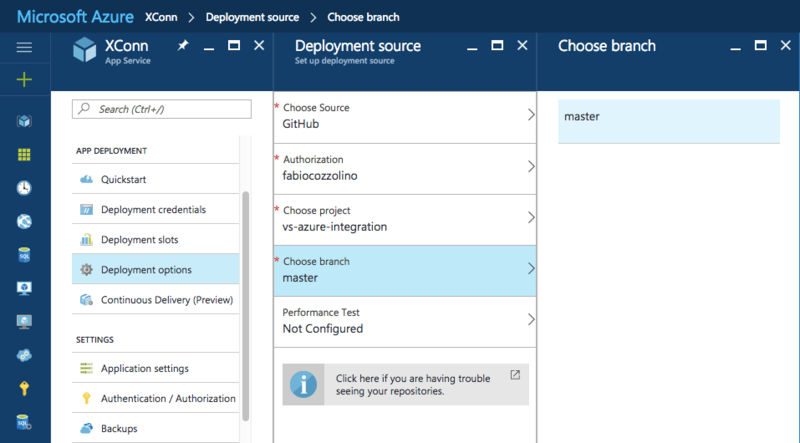 The deployment process is governed by Kudu, “the engine behind git/hg deployments, WebJobs, and various other features in Azure Web Sites”. In small words, Kudu scan the repository to find a project to publish. When done, it will generate a deployment script which first step is restoring NuGet packages from the solution. Ah, the solution! The Connected App solution also include the Xamarin.iOS and Xamarin.Android project. Bingo! The deployment process is trying to solve and build the Xamarin packages on Azure Mobile Service, which is not allowed! 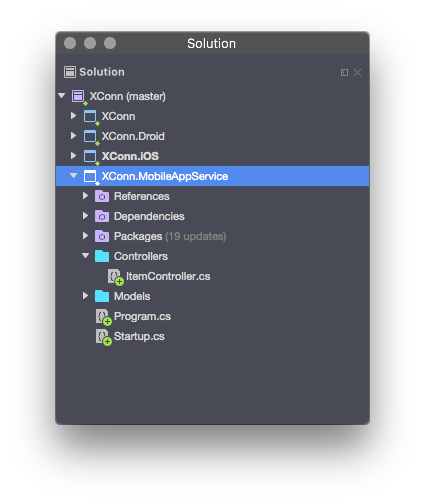 call :ExecuteCmd dotnet restore "XConn\MobileAppService\XConn.MobileAppService.csproj"
call :ExecuteCmd dotnet publish "XConn\MobileAppService\XConn.MobileAppService.csproj" --framework netcoreapp1.0 --configuration Release --output "%DEPLOYMENT_TEMP%"
Finally, you can publish the .deployment and deploy.cmd files to the root of the repository. Once done, the deployment process restart and now … the Mobile Service is up and running!